Itinerary for the July Jip Tour. Saturday Jun 15 Depart: Bon voyage! We depart from Cape Town on Flight QR 1370 to DOHA at 13:20. Sunday Jun 16 Amsterdam: We arrive in Amsterdam at 13:45. We will travel by train to our campsite. After we arrive at camp we will have a few hours to relax. We will have dinner together. After dinner we will visit Anne Frank house and the infamous Red Light district. 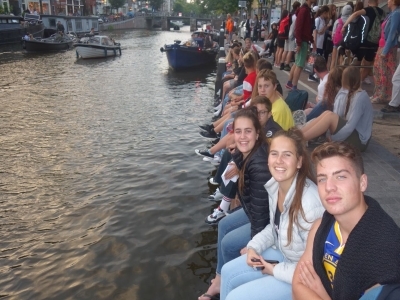 Monday Jun 17 – Amsterdam: Today we will visit the small fisherman’s town, Vollendam. As well as the Cheese and Clog factory, the Windmill Town, Rijksmuseum and Van Gogh Museum. Prepare yourself for a busy day. Tonight you will experience Amsterdam by night. 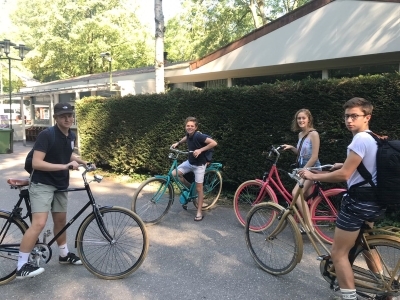 Tuesday Jun 18 - Amsterdam :Today you will get your bicycle. You are free to explore Amsterdam on your own. Off course your tour leader will be there if you need any assistance. A lot of the young people visit the Heineken Experience and some of them see this as one of the highlights of the tour. You might want to visit the Flower Market or the. If you want to visit the Anne Frank Museum please remember to book your entry in advance because the queues are very long. If you want to buy some gifts Amsterdam is probably the best place for shopping. 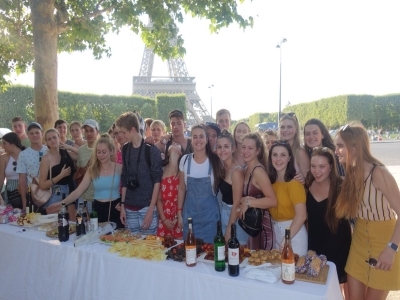 Wednesday Jun 19 – Amsterdam – Paris: Vive le France! Today will say goodbye to Amsterdam and travel by bus to Paris. Tonight we will do a tour of the city of lights. We will see Notre Dame Cathedral, The Eiffel Tower and the river Seine. You will see for yourself why Paris is called the city that never sleeps. 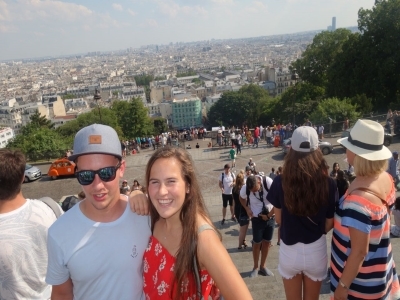 Thursday Jun 20 Amsterdam – Paris:Et aujourd’hui, Bonjour paris! Today we will do a walking tour of Paris. You will have enough free time, but you have to be prepared for a busy day. Entry to Notre Dame and the Louvre are included in the tour. Tonight we will eat under the Eiffel Tower. This is usually one of highlights of the tour. There are huge lawns and it is a nice relaxed evening. Unfortunately, we have no control over the weather and the long queues at the tower might demotivate you. Most of the time there is enough time to see the inside of the tower and the beautiful city of Paris from the top of the tower. Friday 21 Jun Paris- Lucerne: Au Revoir, Paris! Today we travel by coach from Paris to Lucerne in Switzerland. 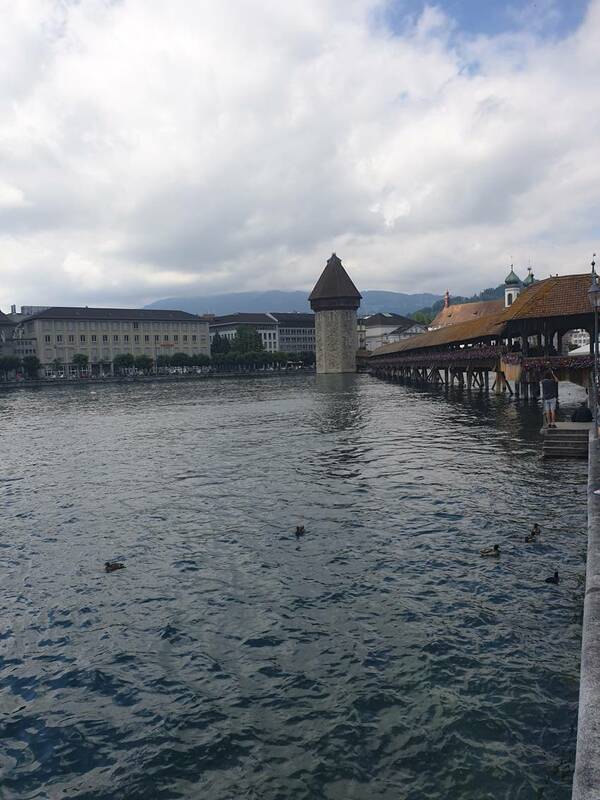 Saturday 22 Jun :The goal of our visit to Lucerne is to experience the Alps and the lakes within the Alps. A visit to Switzerland is not about history or shopping, it is about experiencing the wonder of the creation. If the weather permits, the sky is royal blue and the lakes and snow completes the storybook picture. Today we will visit Pilatus (optional). For this excursion we first take a boat across Lake Lucerne. 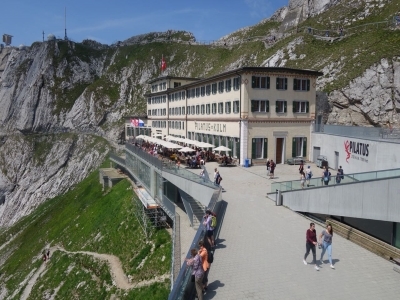 When we reach the foot of Mount Pilatus we will take a cog rail to the peak of the mountain. From there you will first take a big cable car down the first part of the mountain and a small cable car will take you the last leg of the journey. This afternoon you are free to find out if Swiss chocolate is really as good as everyone says it is. Sunday 23 Jun- Lucerne:Today we will visit the St. Gothard Pass. You will have the opportunity to experience the cold mountain air and to visit one of the most beautiful mountain passes in the world. It is a short journey with the coach and the breathtaking scenery makes this outing worth your while. We will return to Lucerne in the early afternoon so that you can visit attractions like the Lion Monument. Monday 24 Jun – Friday 28 Jun Le Spezia : We travel through the world longest road tunnel, the St. Gothard Tunnel, into Italy. We drive through Italy along the Mediterranean coast until we reach the city of Le Spezia. On our way, we will drive through about 200 tunnels and cross just as many bridges. This is probably one of the most exquisite routes you will travel during your lifetime. For the next four nights we will stay at a campsite with swimming pools very close to the beach. You will be free to plan your days in any way you prefer. During your stay in Le Spezia you will have only a few limitations. 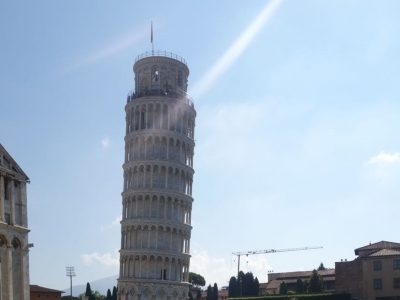 Our only fixed outing is a visit to Pisa. The beaches of Le Spezia are the playground of the world’s rich and famous. You can relax on the beach or explore the tourist attractions of this very old city on your own. We will also give you a booklet with lots of information about what you can do. Le Spezia offers the ideal opportunity to rest after all the walking in the bigger cities. Meals will be included. 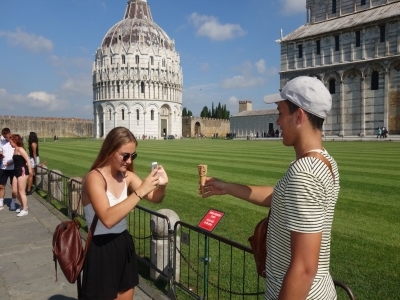 Friday Jun 28 – Sunday 30 Jun Le Spezia – Venice: Venice On our way to Venice we will visit Florence. Our campsite in Venice is like nirvana for young people. On foot we do a sightseeing tour of Venice. O sole mio – A romantic ride in a Gondola is optional. In the afternoon you are free to discover the streets and canals of Venice. Sunday 30 Jun to Wednesday 3 Jul Venice to Rome: We travel from Venice to the antique city of Rome. Rome is a huge historical city with many important sights. We will do a city tour on foot after which you will be free to discover the city on your own. Rome is one of the most important tourist destinations in the world. The history of the city stretches thousands of years. Despite the fact that Rome within itself is an important destination, our campsite is also one of the most popular campsites on the tour. The campsite is host to a swimming pool and a club. On this tour you will have a lot of freedom and it is specially in place like Rome where you will experience this freedom. With freedom comes responsibility. It is therefore very important that you understand limits. These limits are written in the application form and we will not permit you to cross these boundaries. 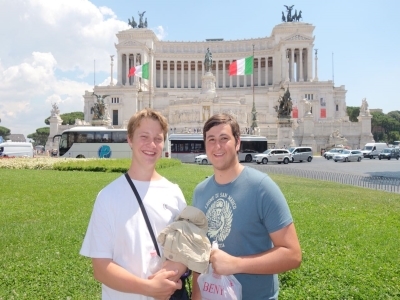 It is unfortunate that the socialization in the campsite in Rome can also lead to some conflict with your tour leader. 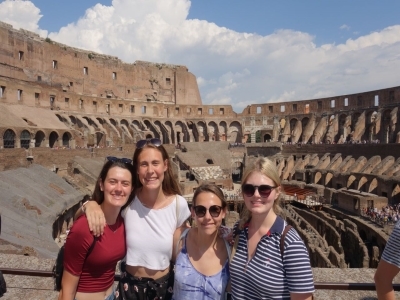 Wednesday Jul 3 - Rome - Sorrento: There is only a small distance between Rome and Sorrento and on our way, we will stop in Pompeii. We will visit the world heritage site in Pompeii before going to our campsite in Sorrento. Thursday Jul 4 Sorrento - Capri: The ferry to Capri is optional, but once you get to Capri you will realize why it is completely worth it. You can explore the Island on foot, with a scooter or a taxi, or you can rent a boat and go for ride around the island. You will have the opportunity to swim in the warm water of the Mediterranean Sea. The Blue Grotto in Capri is world famous and a visit to the Grotto is always an amazing experience. Friday Jul 5 Sorrento - Rome - Dubai: Our last day in Europa has arrived. 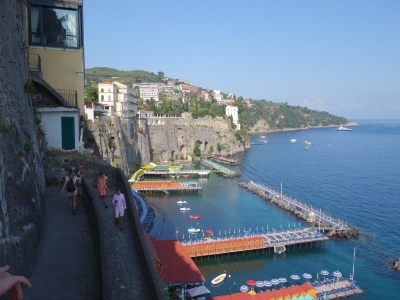 We say goodbye to Sorrento and Europe. At 09:00 we drive to the airport in Rome. At 17:00 we depart on board flight QR132 to Doha. We arrive in Doha at 23:55. Saturday Jul 6 Home: At 02:59 we depart on flight QR1369 from Doha and we arrive in Cape Town at 11:45. Here we take reluctant leave of our new friends and the holiday of a lifetime.